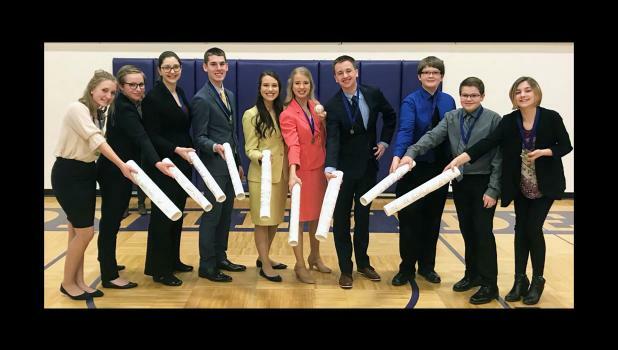 River Valley speakers traveled to Montevideo on Friday, March 29, for the Minnesota State High School League Sub-Section tournament. The speakers arrived and were ready to compete knowing fully that it was make-it or break-it time since only the top four in each category advance to the Section tournament hosted by Southwest Minnesota State University, Marshall, on Saturday April 6. River Valley had a commanding presence in the finals portion of the tournament finishing off the night with 21 speakers competing in the final round and 19 speakers advancing to Sections with the support of their nine champion speakers! Champion speakers are Layla Schwarzrock, Poetry; Libby Tonn, Informative; Anna Reiner, Prose; Elijah Kirschstein, Original Oratory; Grace Pingeon, Drama; Sarah Dunn, Humorous; Colton Jensen, Creative Expression; Jack Scheitel and Mogen Winkelmann, Duo Interpretation; and Kaylynn Sanderville, Extemporaneous Reading. The runners-up include John Ombaye, Drama; Alexis Clemon, Poetry; and Kiera Lafferty, Prose. Third place finishers included Sarah Kottke, Drama; and Isaac Rasset, Informative. Fourth Place finishers included Joseph Jensen, Creative; Ellie Tonn and Bryn Gordon, Duo Interpretation; and Kendall Kelly, Poetry . Two speakers who secured the first (fifth place) and second (sixth place) alternate positions are Meriah Kirschstein, Extemporaneous Reading; and Jace Rosenau, Humorous.